Bayern Munich will demand €70m for in-demand midfielder Thiago Alcântara after the Spaniard emerged as a top target for his former club Barcelona, according to reports. The 27-year-old among a handful of players who Bayern chiefs Uli Hoeness and Karl-Heinz Rummenigge are willing to offload ahead of the new season, with Jérôme Boateng and Arturo Vidal also tipped for an exit this summer. A report from Spanish outlet Marca claims that Barcelona's failure to land Atlético Madrid star Antoine Griezmann has pushed Thiago to the top of the club's transfer wishlist. The Catalan giants are convinced that the midfielder can be convinced of a return to the Camp Nou this summer, but with a contract in Bavaria until 2021 the decision will be firmly down to the decision makers at Bayern Munich. The Italy-born playmaker has spent five years away from Barcelona, with his £20m exit from the club linked to a lack of first team opportunities during the club's most recent golden era. Thiago, the brother of Inter loanee Rafinha and cousin of international teammate Rodrigo, has gone on to make 153 appearances for Bayern Munich across all competitions, scoring 25 goals and claiming 27 assists. The 27-year-old has also lifted five ​Bundesliga titles during his time in Bavaria, as well as two German Cups and Supercups. 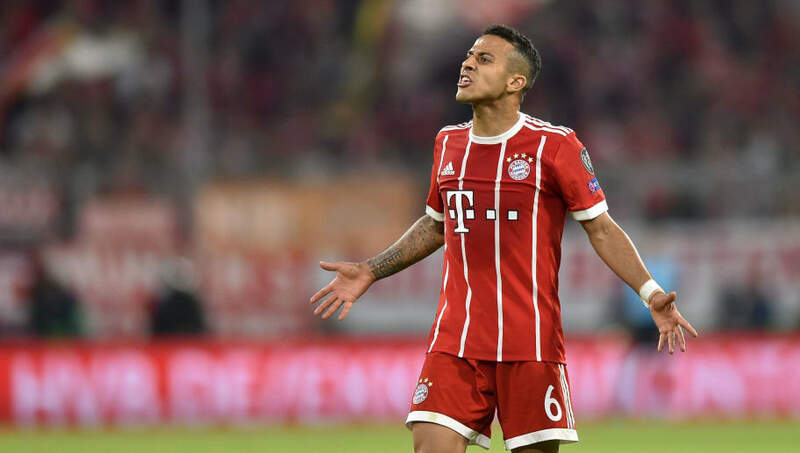 Germany legend Lothar Matthäus even claimed that the reigning league champions should consider offers for Thiago this summer, adding that the midfielder "is not a player for Bayern Munich" in an interview last month.